I almost threw this out, unseen. It was on the reverse side of a worksheet, the side that hadn’t been set apart as being for something. 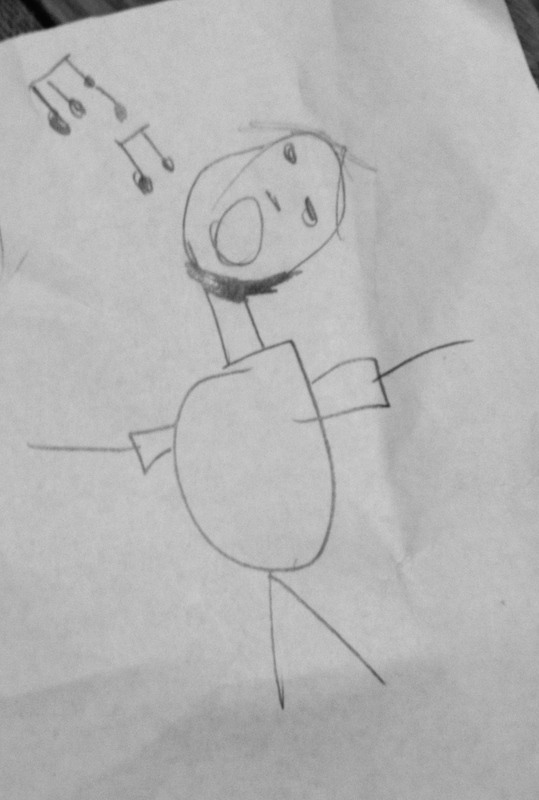 One minute I am in rote Mom mode, flipping through, piling and preparing to dispense of the day’s stack of first grader school papers, bundle readied for the garbage–and then I see the drawing. Because that’s what you say to your 7-year-old, because how can you explain to him exactly all of the things his drawing pushes around in your heart? That what he meant as an imitation you are seeing as a beckoning, as an invitation for arms-open-in-song abandonment, as joy? But the act of wanting to draw, drawing is this same beckoning, abandonment, joy. Something both he and I long for in life, in our own ways. And that’s a new connection. A little tradition.